If time is of the essence why not watch the whole tutorial is under 10 mins! First things first. Let’s prepare the board. Rose has a cool trick up her sleeve that gives a realistic concrete effect. There will be a bit of airbrushing involved so be prepared for this and definitely have a practise before committing to the board. As this is quite a rugged design you will get away with it not being perfect. Other than that, you will get creative with a dresden tool to make some cracks. So the cake is made of three layers for the back of the boot (where the foot would go in) and two for the rest of the cake. Just a little bit of ganache to stick together like bricks and we can start carving the basic shape. Remember to download the pdf provided or if you are feeling adventurous you can create your own template. This part is trickier than it looks so pay close attention to how Rose lines up each side and carves bit by bit. We would definitely recommend you do some very light carving before cutting deep into the cake. Now that we have the basic shape it’s time to fine tune it. There may be a temptation to keep hacking away, but do try and take a few moments every now and then to step back and take a look. 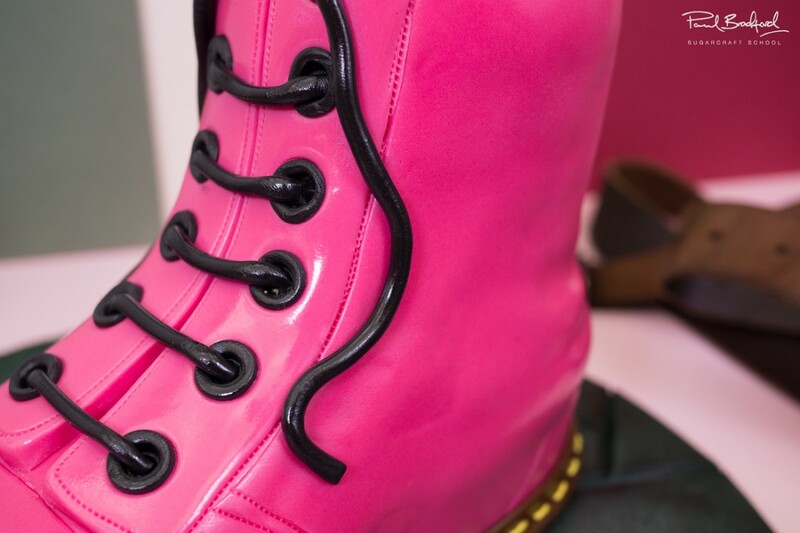 It might be an idea to have a picture, or better yet, a doc marten boot in front of you to refer to. Bear in mind that this will be covered in ganache and then sugarpaste so don’t be afraid to cut it a little thinner than you feel looks right. Paul has yet again converted another cake designer to ganache! Maybe you’ll be next? Just a thin layer of ganache for this cake will do and then pop it in the fridge. This cake won’t be covered in one large piece of sugarpaste but will be done in sections. Definitely take your time with this part and remember that you can always take it off and start again. It’s time to have fun with our best friend, the stitchy tool. 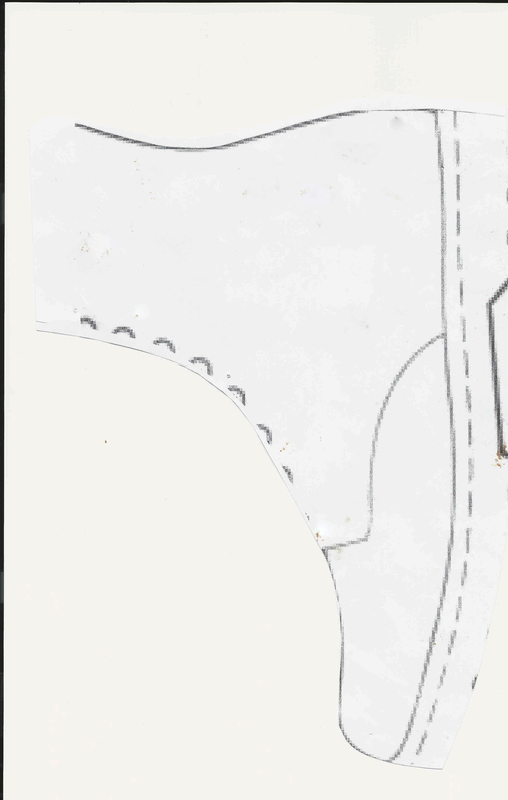 Copy the stitching you see on the real boot or picture and make sure you have a steady hand as trying to get rid of any unwanted lines can be difficult. A bit of water and a dresden tool or your finger may work to smooth it over and start again but try your best to get it right first time round. It’s time to start adding some more detail to the boot. What use would a boot be without laces. 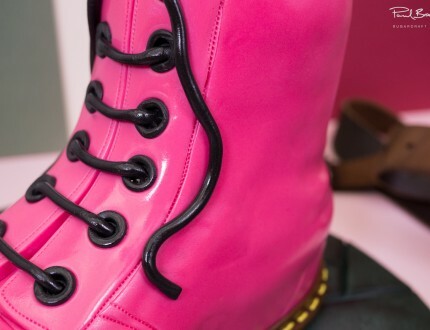 Rose shows us how to make quick and easy eyelets and laces. There are other ways you can do this but this is quite straightforward – a couple of PME plunger cutters, a little bit of water and some sugarpaste is all you need. 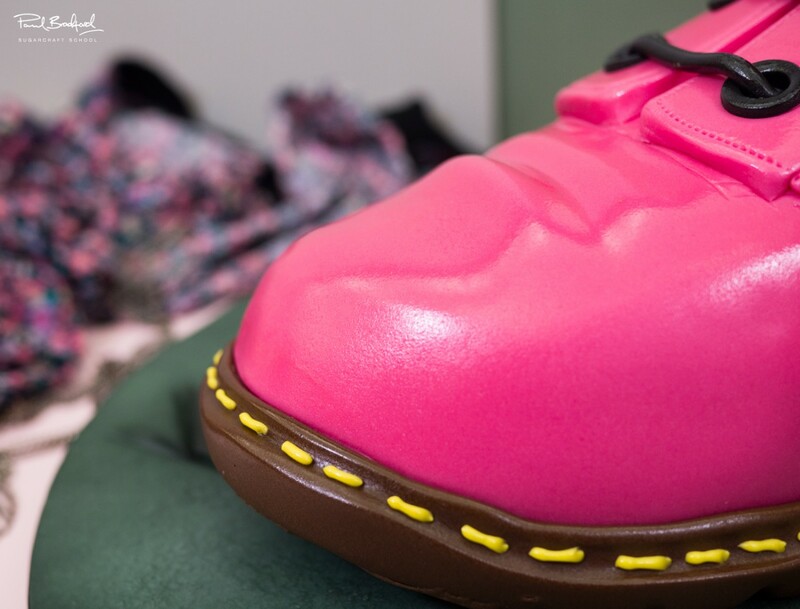 In this lesson we will be making the sole with one large piece of sugarpaste. 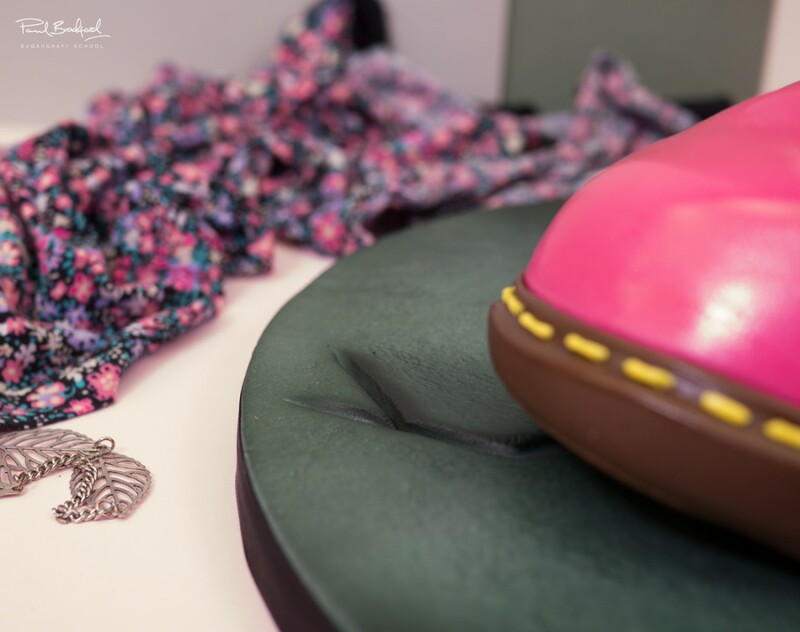 You will be amazed by the realistic results achieved with one piece of sugarpaste and a dresden tool. Again, make sure you refer to your image or boot and there is a lot more room for error here as it can very easily be smoothed over or removed so take your time and have fun. We’re not finished with the sole just yet, just a few more little touches and the sole will be finished. First of all we need to get rid of the exposed pink sugarpaste at the front of the boot. As it won’t be seen there’s no need to add any tread detail to it, but simply stick it on and cut it neatly. Now to add the signature Doc Marten stitching around the sole. You will be using a no. 2 piping nozzle but fear not if you are not accustomed to piping work as this is very simple piping. We bet you’re surprised how quickly this all came together! We are very nearly finished with just a few all important finishing touches. Rose helps inspire you to make this cake unique by providing useful tips and ideas. 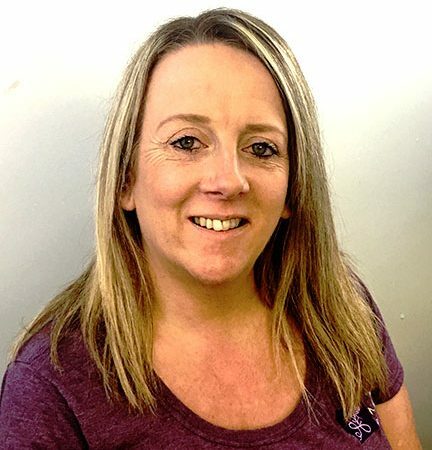 In this lesson, Rose gives us some inside information on costs and provides advice on pricing your cake if you are making it for a client. If time is of the essence, why not watch this entire tutorial in under 10 mins! 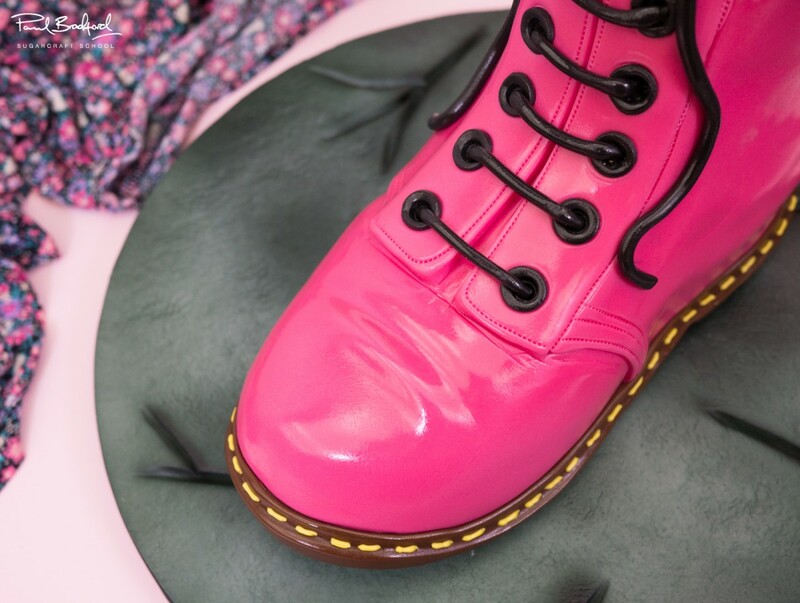 Rose Macefield introduces us to her fantastic Dr. Martens Boot cake. A great variety of skills are used in this tutorial including carving, sugarpaste covering and detailing along with airbrushing and basic piping work. This cake is aimed at intermediate level or a beginner looking for a challenge and will take around 4 hours to make. We are sure you will enjoy this week’s tutorial and would love to see your creations – share your snaps with us on our Facebook Page!